Long before Fibromyalgia became obvious, my chronic pain journey began in 2008 when I was diagnosed with TMJ disorder. During the Spring I had’ been fitted for orthodontic braces and the pain began before the braces went on. The pain began immediately after the spacers were installed to make room for the brackets and continued to worsen over the next few months. I reached a point where I could barely get off the couch and only did so to go to the chiropractor. It was during one of those visits (which was one of the few things that helped at all) that he mentioned he thought I might have TMJ disorder and that may be causing the pain. I began to research it and found a wonderful doctor in Nashville who confirmed that that was likely the cause of my pain. After having the wires removed from my braces the pain diminished greatly. But, it was another two years of treatment before I would say I was 90% improved. And, I will wear a night splint (night guard) forever to prevent my jaw from returning to the incorrect position. There are many symptoms associated with TMJ disorder that would surprise most people. And, almost all of them overlap with symptoms of fibromyalgia. My primary symptoms of TMJ disorder were extreme pain in the head, neck, and shoulders, tinnitus, and fatigue. Much like fibromyalgia, TMJ disorder has a much higher predominance among females than males. Most of these were more likely (by 6 times) to appear AFTER they were diagnosed with TMJ disorder. All of these co-morbid issues are also common co-morbid conditions with fibromyalgia. When fibromyalgia entered the picture for me (about 2 years after my TMJ disorder diagnosis) my TMJ doctor told me that he felt they were connected. In fact, he believes my fibromyalgia is actually TMJ disorder. I believe they may be connected (perhaps the TMJ disorder was the trauma that sparked fibromyalgia), but separate entities. However, a 2017 study examined the prevelance of TMJ disorder in fibromyalgia patients, including those who had not been previously diagnosed with TMJ disorder. This study looked at both subjective symptoms, clinical diagnosis, and ultrasonographic evidence of TMJ disorder. They found that TMJ muscular disorders were present in most of the fibromyalgia patients. Evidence of degenerative TMJ disorder was present in the ultrasonographic studies of ALL of the fibromyalgia patients in this study. Perhaps, there’s more of a connection here than I ever would have thought. Do you have TMJ disorder and fibromyalgia? Do you think they are connected? I’d love to hear your thoughts on this. Please share them in the comments below. I also have TMJ and use a night guard. It came on a week after I had a cancerous tumor removed from my neck, which then led to a thyroidectomy several years later, which is when I noticed symptoms that are now supposedly fibromyalgia. So yes, TMJ was and is in the mix for me, among other stuff. If I had to guess they probably had your mouth held open for an extended period during that surgery. That’s what kicked it on for me – when they had my mouth extended to put in the spacers for braces. I was diagnosed with TMJ in my early 20’s when having my wisdom teeth removed. Although it may be possible that some* people diagnosed with fibro may just br experiencing TMJ symptoms. 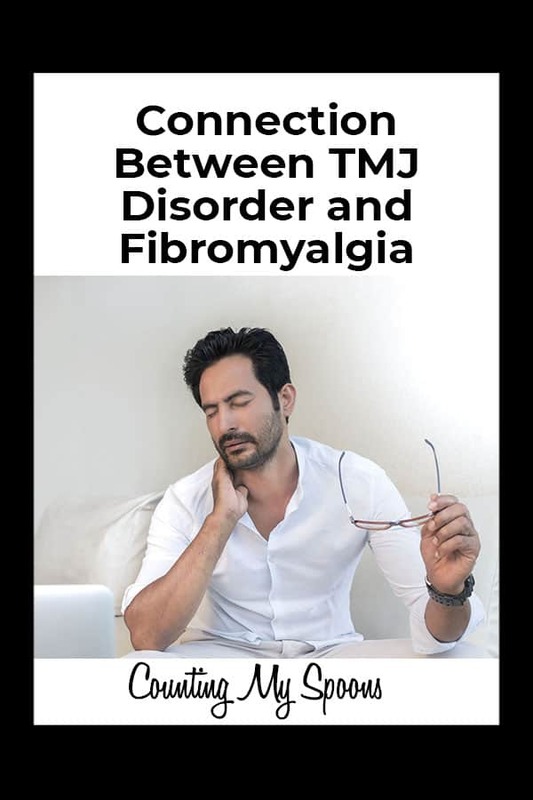 It is my opinion that TMJ and Fibro correlate with one another. I had tmj problems about five to seven years before fibromyalgia-like symptoms. I just recently became the organizer for a chronic fatigue, fibromyalgia, etc meetup group in Birmingham, Al. So I hope that anyone interested will join. Please!! watch Root Cause its on nexflex.. Its an eye opener. It just may be the reason we are suffering..
My TMJ problems started after I was put to sleep to have all four wisdom teeth removed as a teen. Being put to sleep allowed my jaw to be overstretched and I began noticing popping in the joint and fatigue with chewing. Before the extraction, I chewed gum piece after piece all day at school. after the extraction, I couldn’t chew him for more than ten minutes. Several years later in college, I start having TMJ pain and realized that I was clenching my teeth during the day and grinding them at night. First dentist I saw made the problem worse. I saw several different chiropractors (I was in chiropractic college) with little to no relief with various techniques and modalities like ultrasound and TENS. Then I took a course on TMJ by a Dentist-Chiropractor from TN who showed me that my jaw is sensitive to the thickness of a piece of cellophane (any fillings on the chewing surface must be fitted EXACTLY or on my that tooth and the opposing one will touch. He referred me to a local dentist who made me a tripod splint. Nearly twenty years later, I had a stroke, and the following year was diagnosed with fibromyalgia, and the next year, I was finally diagnosed with an autoimmune disease that I can trace back to middle school. Julie, I was diagnosed as a teen with TMJ and diagnosed with Fibromyalgia in my late twenties. I have every diagnosis in that article except endometriosis! It is very interesting. I am close to 60 and haven’t been able to work for some time. I am going to try disability and appreciate your information on that. You had it in your blog several months ago. Here’s hoping! Thanks for your emails. I always find them helpful. I too was diagnosed with TMJ years before I was diagnosed with Fibromyalgia. I was also diagnosed with endometriosis, migraines, and chronic fatigue syndrome. I have had TMJ and have Fibromyalgia. I developed TMJ syndrome from jaw clenching at night. I was also having migraines during this period in my 30’s. My TMJ became so bad the disc in the joint detached causing my jaw to be locked, and had to be surgically repaired. I had successful orthodontic treatment and my TMJ resolved. Two years ago I again developed TMJ disorder and a TMJ expert told me I would require expensive ($40k+) treatment to realign my jaw. However, my dentist probed me above any changes in my health (I am a medically complicated person with multiple chronic conditions) and she revealed that my new Rx for low dose ritalin (for fatigue treatment) is known for causing jaw spasms. I stopped taking it and within 24 hours my jaw symptoms were gone, and no TMJ treatment was needed. The morale of my story is, TMJ may or not be the problem and it is worth diligent investigation before jumping into treatment. As for TMJ and a link to Fibromyalgia, in my case I am skeptical because it was more than 15 years between my TMJ resolution (first incidence) and Fibromyalgia development. There were other events and injuries sustained that appear to be the trigger for Fibromyalgia in me. That said, a trigger is just that and while it doesn’t appear likely that it was a trigger in my case, it certainly could be for other people. I have MAS (Multiple Autoimmune Syndrome, 5 autoimmune diseases) and we believe these are the trigger for my Fibromyalgia. Having lived through TMJ syndrome for 2 years, anyone with it has my sympathy, it can be brutal and unrelenting, just like Fibromyalgia can be.